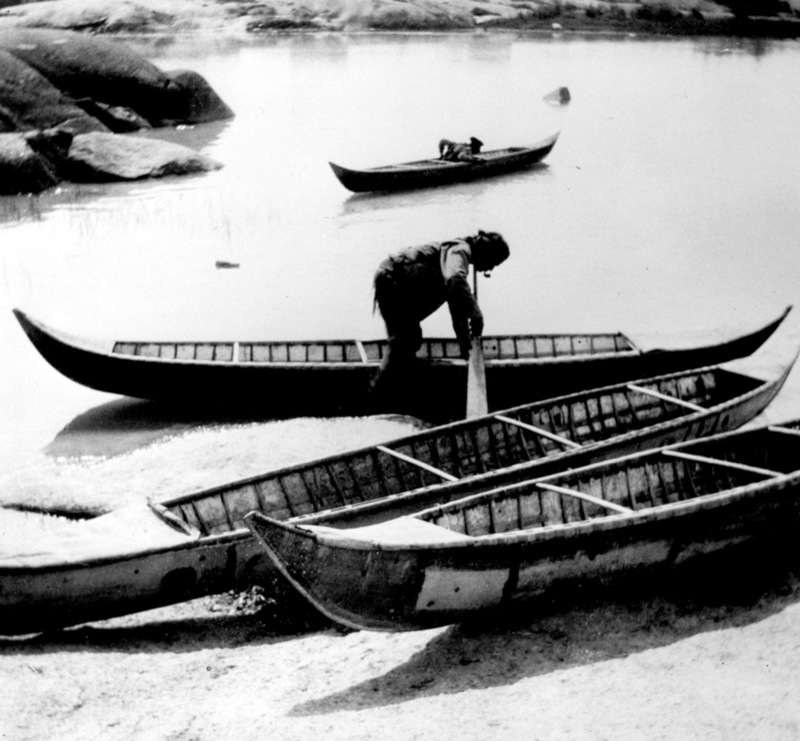 Used extensively until the 1940s, when commercially manufactured boats and canoes began to replace them, the Tłı̨chǫ canoes were similar in form to other Dene hunting canoes. 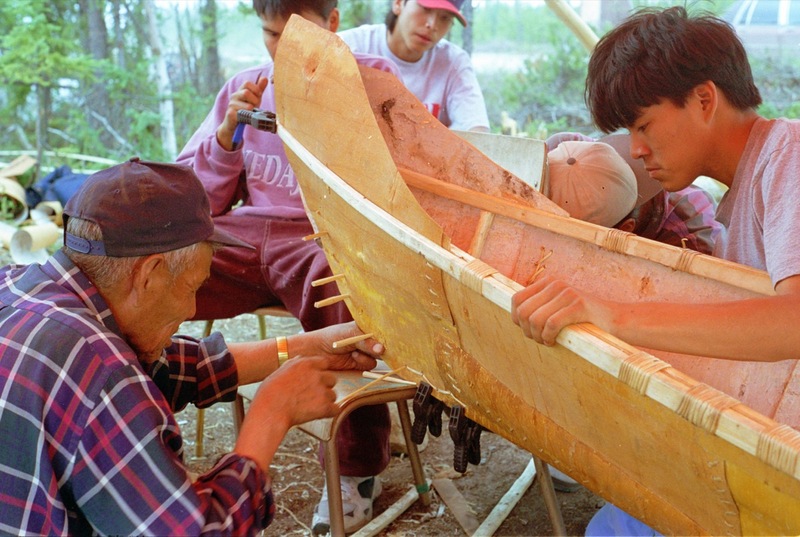 Tłı̨chǫ canoe building included two styles or sizes of canoes: an open cargo or family canoe, generally 5 to 7 m in length, called k’its’i, and a smaller hunting canoe, called k’ielà or “birch canoe.” Tłı̨chǫ oral tradition indicates that spruce bark canoes were also built, though rarely. 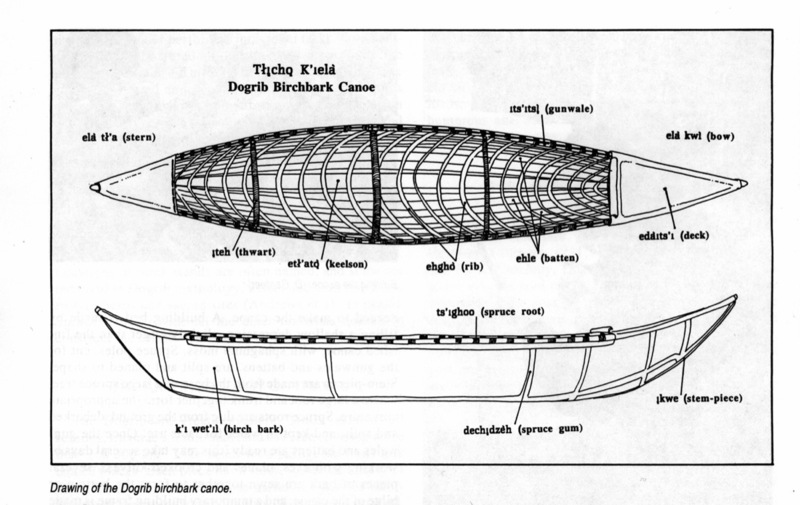 The Tłı̨chǫ hunting canoe was generally 3.5 to 5 m in length, with an average beam of 41 cm, and a depth of 23 to 28 cm (see drawing). Decks covered both stem and stern, and a small birchbark roll, sewn to the base of the foredeck, channeled spray away from the canoe’s interior. The stem and stern stem-pieces were constructed of curved planks of spruce. Their exposed leading edge allowed the canoe to be grounded on rocky shores without immediate damage to the bark. The rake and profile of the stem and stern were sometimes identical, though most often the rake of the stern was greater, giving it a slightly higher profile. The stem-pieces were connected by a keelson. 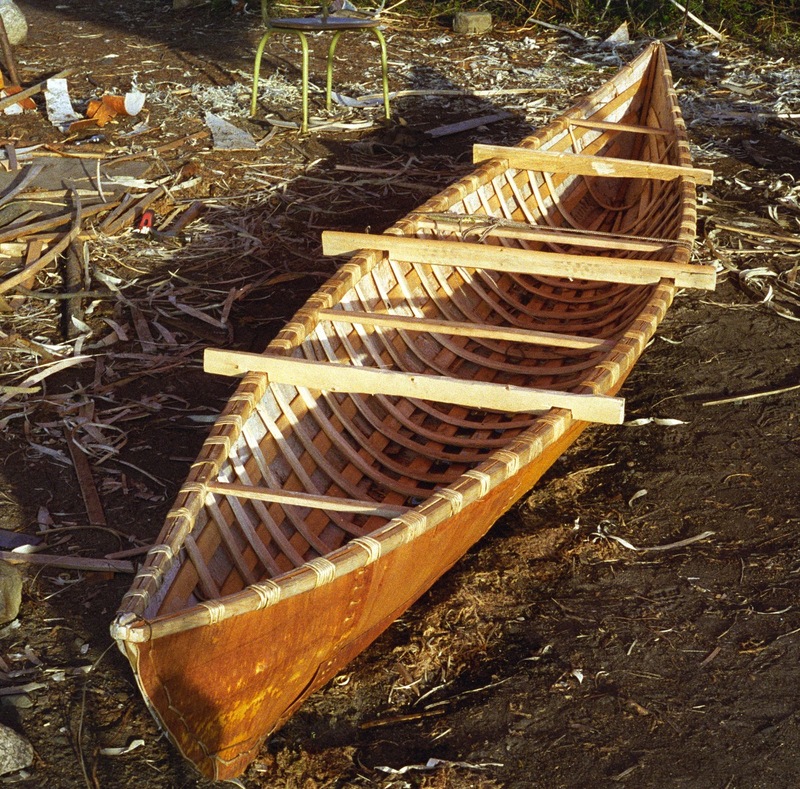 Gunwales, consisting of an inwale and outwale, compressed the bark skin of the canoe, and were lashed in groups with lengths of split spruce root. Spruce ribs, up to 35 in number, located approximately 30 cm apart, were bevelled on the ends and forced between the inwale and the bark, providing tension to the bark skin. The sprung ribs also held eight loose battens or stringers, as well as the keelson, in place against the bark. Five thwarts were tenoned and pegged to the inwales. The fore and aft thwarts supported the deck coverings. It takes time to build a good canoe. 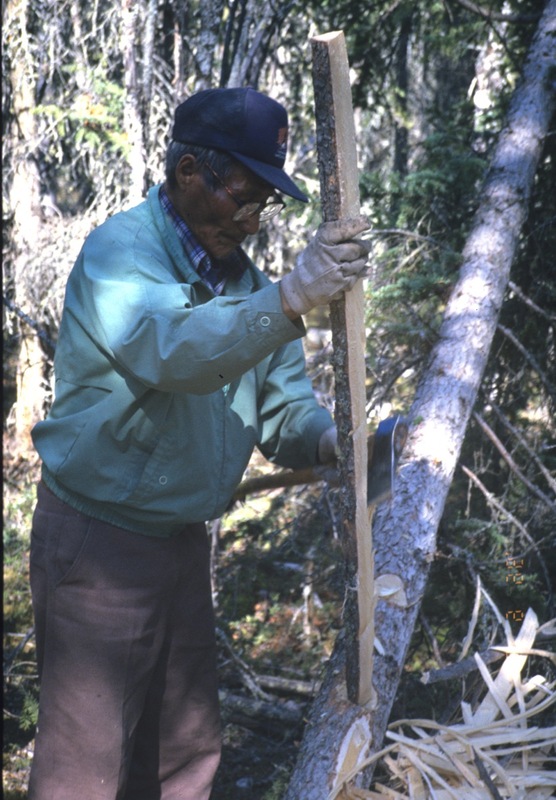 Elders told us that a skilled worker in urgent need of a canoe could construct a serviceable one in five days. More typically it took more than twice that amount of time to build one. 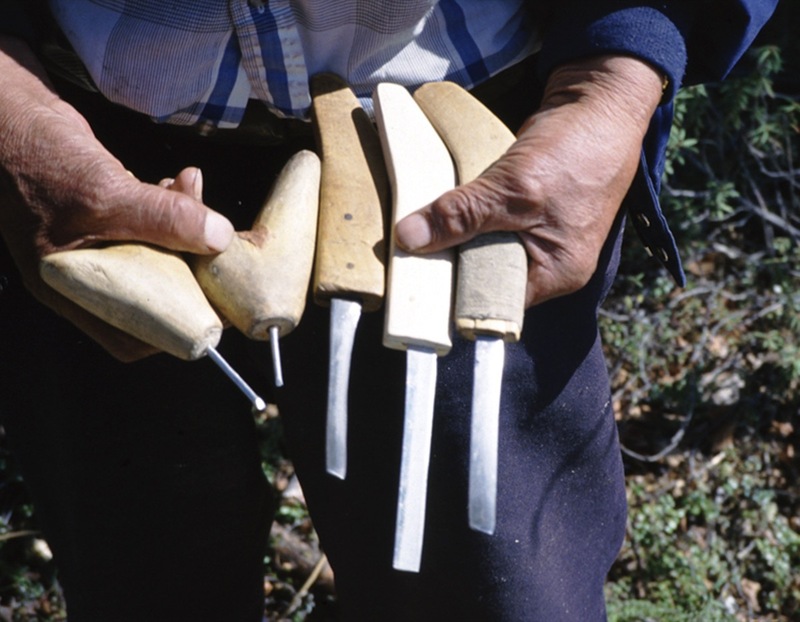 Only three tools are needed to make a canoe: an axe, an awl, and a crooked knife. Canoes were often made by several families, all working together to make a number of canoes at the same time. Both men and women worked together, though at times each gender performed individual tasks. 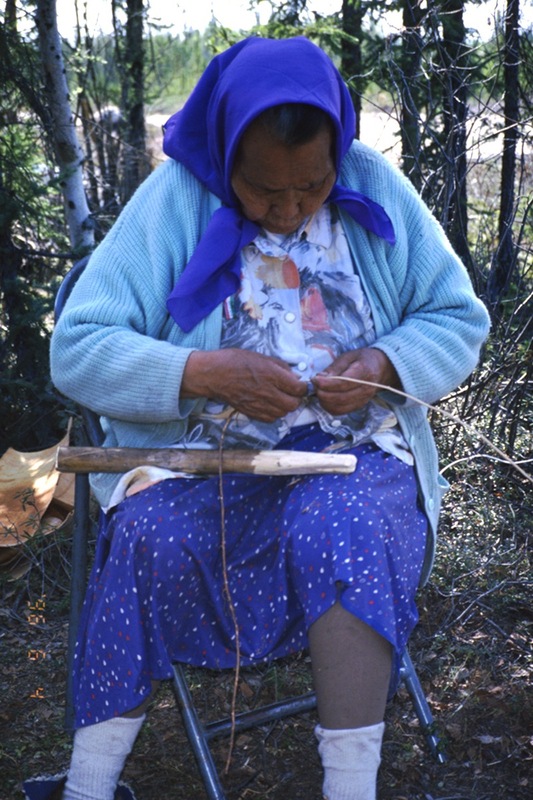 For example, men manufactured all the structural supports for the canoe, and women did most of the spruce-root sewing. The women collected and prepared most of the spruce roots and gum, though this was sometimes a shared labour. Even children were pressed into helping by gathering moss and roots, and were often asked to collect and chew gum for the final sealing of the seams. 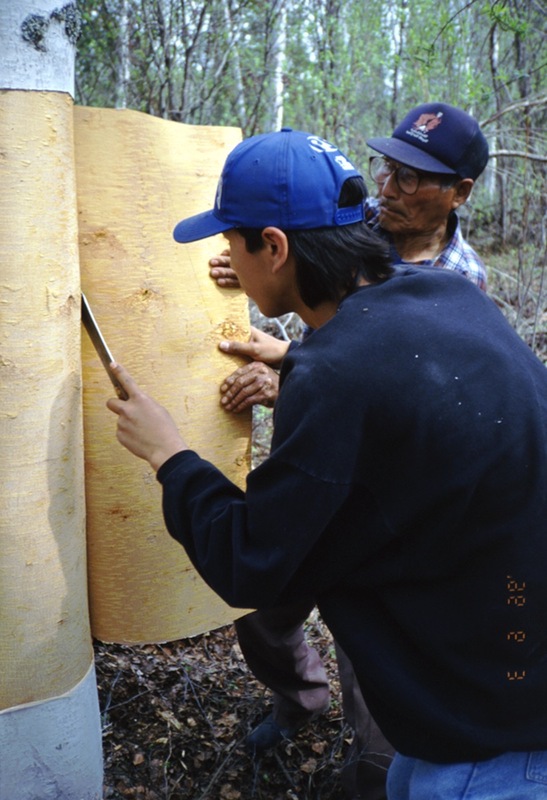 Canoes were typically made in the spring, from late April until early June, when the trees were running with sap and it was easy to take bark. 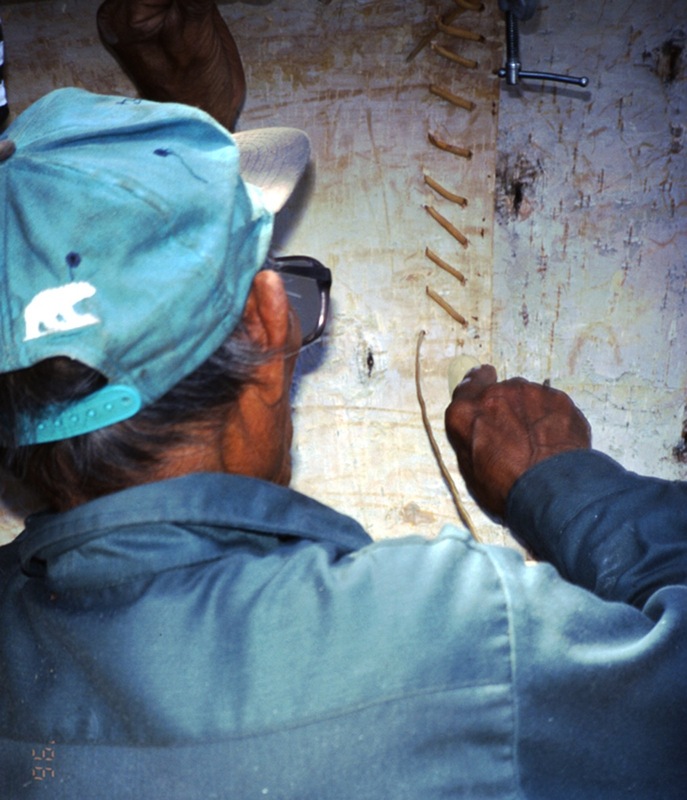 In June of 1996, six Tłı̨chǫ elders spent two weeks at Russell Lake building a birchbark canoe. In conjunction with extensive documentation in a variety of formats, a video was produced that celebrated the rediscovery of nearly lost skills. It also demonstrated the sharing of talents and effort that communities required to make a living off the land. Produced by Lone Woolf Productions for the Dogrib Divisional Education Board in 1997.